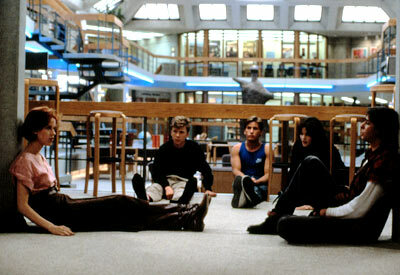 It’s time that I mentioned The Breakfast Club. Without a doubt, one of my favourite films; if not my favourite. A film I have watched more than any other and a film that makes me laugh and cry every single time. Set in an American high-school on a Saturday, we follow the conflicts and complexities of five adolescents as they sit out a full days detention. Each has a different friendship group, each has a different attitude towards the politics of high-school and each has a separate reason for being in detention. Their individual struggles with personal issues leads to arguments, rebellion, bullying and humiliation. We see the characters dismantle themselves, and each other, as the film progresses. A film that deals with divorce, suicide, neglect and regret and gradually sinks into a darker place than you first expect. This witty and well scripted piece of work is a unique and accurate insight into the cruelty of high-school and the uncomfortable journey into adulthood. These characters reflect so many different aspects of high-school life and the most joyful element of this film is that not one of them is who they appear to be, initially. By the film’s conclusion, as we see Judd Nelson’s character raise his fist to the sky, we realise how alone each character feels and despite their differences and conflicts with one another, they are just trying to figure out themselves and the world around them. Nearly all of us have experienced the brutality and insecurity that high-school can bring. The Breakfast Club illuminates this brutality and not only dissects it but contradicts it in the most quirky and entertaining way. for whatever it was we did wrong. in the most convenient definitions. Tags: Teen Films, The Breakfast Club. Bookmark the permalink. Previous post ← Encounters of the Briefest Kind.